NATURAL HABITAT AND PREFERRED SITE: Native to Syria and adjacent areas of the Middle East, also native to the warmer parts of Europe, Asia, Africa and Australia. It is cultivated here and grows well on most soils except heavy, non-draining clay soils. Needs full sun. 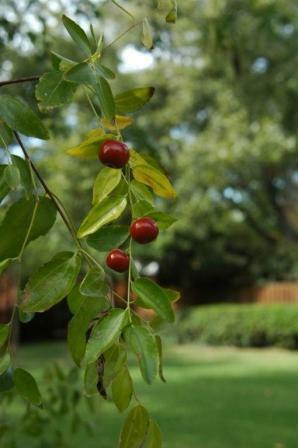 IDENTIFICATION INFORMATION: Jujube is an interesting tree that grows to a height of 50 feet and generally has a rounded head and has interesting zig-zag twigs, fruit in the late summer and yellow fall color. FLOWERS AND FRUIT: Flowers appear March to May in clusters of small yellow flowers. Shiny, edible date-like brown fruit that starts developing in the late summer and matures in the fall. Fruit starts out green and turns yellowish and reddish brown to black at maturity. The pulp is sweet, edible and date-like eaten fresh or made into preserves. Young trees will bear fruit when they are about 2 years old. Flowers are rated as minor source of nectar for honeybees. BARK: Reddish, close-grained, fine-textured, mottled gray or black that tends to be very smooth on younger growth but gets tough and durable with age. It is also valued as firewood: is a good source of charcoal and activated carbon. FOLIAGE: Leaves are alternate on zigzagging twigs. Fall color is yellow. The leaves are readily eaten by camels, cattle and goats and are considered nutritious. CULTURE: Jujube is easy to grow in most well-drained soils. It is slow to moderate in growth and requires minimum amounts of water and fertilization although will do better with moderate amounts. PROBLEMS: Can spread by roots, sprouts and seeds to become a rather severe pest, but I still recommend it. PROPAGATION: Easy to grow by seed. Collect the fruit as they mature in the fall and plant straight away or clean the pulp from the seed and store at 41 degrees through the winter to plant in the spring. Can also be grown from suckers or grafting of selected cultivars. The stones must be taken from fruits that have fully ripened on the tree. Soak the seed in 15% sea salt solution or Garrett Juice Plus for 4 hours. Cracked and the separated seeds will germinate in 7 days. Seeds in uncracked stones require about 20 days. MEDICINAL USES: The fruits are applied on cuts and ulcers and act as a general health tonic with little to no side effects. Jujube is reported to have health benefits, to relieve toxins and help with insomnia and night sweats. 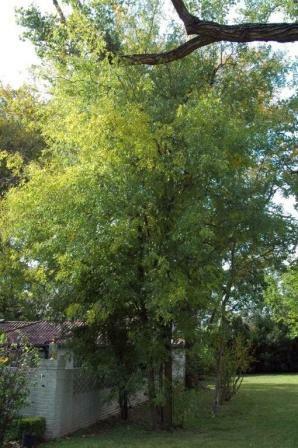 INSIGHT: A unique shade tree that should be used more. Fruit tastes like dried apples and is used medicinally, especially by Asian gardeners - in fact, you will rarely see mature fruit on jujube trees in public gardens because they are sought after. ‘Enermis’ is a thornless variety.